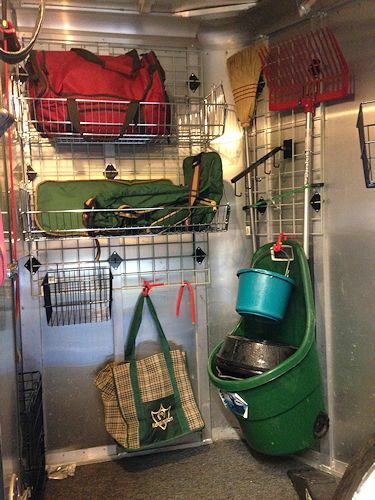 Leave your horse trailer organizing tips: do you have a great idea like this one? Do you have a well organized trailer? Or even just one idea that has made a big difference in an otherwise cluttered mess? I found this photo and at the moment it is the best idea I have seen yet. I have been day dreaming about hanging my had cans from the ceiling in the horse trailer….a space saver and they are light. Otherwise I am out of ideas. If you have a great idea please post a picture or a comment. ← Our airport adventure and freestyle reining? I have a 4 horse with a 4ft short wall . We put a small dresser on the short wall, it has 3 small drawers on the top row and 4 larger beneath. My daughter and I each have a drawer for clothes, other drawers are designated for kitchen supplies, medicine, hatband etc. , extension cords…. It’s awesome. It leaves about a 3 inch gap in the back which perfectly fits a fold up saddle rack. A fold up table and 2 chairs are bungee corded to the blanket bar on the wall. hung a cheap mirror behind the dresser, we can camp in this thing really comfortable. Everything has a place to live, it’s great!!! I keep a lot of my stuff in a big wooden chest in the barn and it can hold A LOT. When I went with a group of friends camping I brought it and kept my saddle, bridle, bucket for brushes, saddle pad, helmet, halter and lead ropes in it and it kept me organized pretty well. I LOVE my shoe organiser hung in the tackroom door. All grooming utensils and products very handy, no bulky brush box to lug around. I do this too! In the house and the tack room of the barn! I’ve also seen vertical saddle racks that hold the saddles on there end. That would make a huge difference! I have a closet organizer designed to hold shoes. It hangs on the door and has pockets- 24 of them. It works great for things you use frequently, the pockets are clear so you can see what is in there. Mine was inexpensive, so may not hold up to long trips since it is not secured at the bottom. But I am sure there are better quality ones out there! We have a 3 horse slant, but almost always only haul 2. Our first stall next to the LQ is storage. We put many hooks, the kind that has 3 hooks that all fold back flat against the wall, up high on the wall of the LQ. If we need to haul a 3rd horse in that stall, the hooks are very high AND fold flat. Then, we hang everything that can be hung from those. We transport our hay in that stall, too, and for that we bought a cheap cargo net. We stack the hay high, and hook the cargo net on one of the aforementioned hooks, then bring it down and hook it to the string of the bottom bales of hay. The hay can’t fall over onto the horse in the second stall. Oh, and that first stall wall is a stud divider, so nothing slides under the first horse. We can get 10 bales in there, and have the other half of that 3rd stall for other things, especially since we hang so many items. Unfort I do not have have a picture of this but brinin out the redneck in my dad and I, we came up with a clever way to turn a stock trailer into a slant load. We purchased a 16 ft stock trailer with a middle gate. You could load two horses in the front side by side and two in the back side by side. My dad took the middle gate and attached it at a 45 degree angle towards the front of the trailer to make a makeshift tack room which with the escape door worked great. He then used fourwheeler ramps to make the back section of the trailer into a 3 horse slant. I loved my redneck trailer! Sold it last year. I also keep almost everything in my living quarters in bins…all the shelves have bins…makes it much easier to keep items together and easy to pull a bin out and find what u need, keeps things from falling over while on the road, and you can load the bin up with more items than if they are on the shelf. Great for bathroom with toiletries for each family member. I think that is the key…thanks for the reminder! there is also a sight on FB called Horse Trailer Conversions…..they are constantly posting organizational tips on how to maximize small space and they also have links to some great on line sights for purchasing/ideas….and of course you can search on Pinterest too! There are lots of great ideas for maximizing small space for storage. If you need extra saddle storage and have the saddle rack that came with your trailer in the rear tack, save by buying a stand alone saddle rack and wiring it into the corner of dressing room. My husband is going to make me a little PVC pipe saddle stand for my English saddle and put it in the gooseneck and keep the four racks for western saddles. Also a shower rod to hand squirt bottles, blankets, bell boots etc. I also love the Velcro idea. Stacy, Thank you so much for bringing up this topic. I have a trailer I love. It has a weekend package which works fine for me but there no place to hang clothes. Argh….. I am always in search of ways to make better use of the small space I have. I hope the suggestions and ideas keep coming !! We put heavy duty sticky back velcro on the upper part of the door. Its a great way to organize sports boots and helps them dry faster. Plus they are in a handy spot that you usualy cant use. Ahhh! I LOVE it! I am totally going to use that idea, I am always sticking them back to themselves and hanging them over something. Much better idea. I have a 3 horse slant bumperpull with a walk in tack room, and the slant wall is one that opens into the trailer so there’s a gap at the top.I have lots of portable tack hook racks (from schneiders) that I hang off of the top of the slant wall. I hang my cinches there so they can dry, and my lunge line. I keep one or two big tupper ware tubs too. In one I keep leaky things, like fly spray, showsheen, etc, and in the other I keep my brushes, rubberbands, ribbons, braiding/banding gear. My work tack hangs on the hooks in the trailer, and my silver show tack and my barrel and pole tack are in zip up tack bags that I can also hang. Stackable tupper ware tubs with snap lids make everything easy! I can even stack blankets and pads on them when needed. I know my tack room is small, but I have to work to keep it organized haha. Good luck!! Hi Stacy, I made some great space saving straps in my old trailer. I got some very small stainless steel brackets and riveted/screwed them up very high in the horse compartment. I used the brackets to strap some large but light items, like our swags/bedding. Sorry I don’t have a picture for you. I sold that trailer to help pay for the furniture truck which I’m converting into a horse truck. Ps, remember everything rubs and scratches holes in things, unless secured well. I was thinking of having some hooks, etc welded in to hang from….sounds similar to what you did. We had a guy that made hooks out of used horse shoes install several up high in the horse area of our trailer. The first stall in our 3 horse slant load rarely has a horse in it so we hang bags with fly sheets, extra tack, etc from them. We also have a few of the moveable hooks & like others, a couple Rubbermaid tubs to store stuff that doesn’t have to be easily accessible but still needs to be along, i.e. electrical cords, hoses, tire changing stuff etc. sorry, no picture since the trailer is in storage for the winter. One of my friends uses those stand up plastic see thru three drawer organizing storage deal-a-ma-bobs. She put three right next to each other under her saddle racks. She also has 8 1/2×11 pictures standing up in the very front of each drawer and you can see them from the outside. It looks cute and no one can see all the stuff you got stuffed in your drawers! Added bonus you can use the top surface of all of them for other items. I love the organization of this trailer. Trailers do become disorganized at times but this is great. I will definitely have to put my thinking cap on and try some of these. I hung a magnetic tool strip in the tack room. Its a strong magnet for holding wrenches and screw drivers but it will also hold hoof picks, bits, shoes and other odd things that need attention instead of getting tossed in a box and forgotten. I always keep my trailer organized makes things so much easier to keep it all clean. The key to organization for me is finding a spot for everything and making sure it goes back to that spot. I do have a couple of those rolling tool boxes that I keep certain things in that don’t always have to be in the trailer so I can easily take them in and out. One of them in my first aid kit and other similar items that can go in and out as needed and easily transport to the needed area. I also horse camp a lot so some of my camping gear is in another. Its like trying to do a puzzle and getting the pieces in the right area. I also have four sets of hooks in different areas of my trailer and each set is designated to a different type of tack. My every day riding gear is the easiest to reach from the ground without climbing in and the stuff I use in special cases or my daughter’s gear is in the back and up higher that I have to get in for. I am sure my tack room is much smaller than yours but that makes it probably harder to organize and get to everything easily. I have a lot in a little space so making it work is work but a must. I have a plastic 3 drawer organizer that has different size drawers that fits perfectly under my saddle rack. Photo! Photo please! We have the nose of the gooseneck and just a 4′ short wall so not huge either. I have this system from the organized barn and tack store! I absolutely love it!!! I bought extra baskets and it keeps everything very well organized!